Alzheimers New Zealand Conference on Friday 25 May. New Zealand was lucky to have a visit from John-Paul Bell talking about humour as a therapy. Humour Therapy- is it directed at “quality of life, saving money, more jokes - fewer drugs”? The answer, all of these and more. This is real therapy (there is an improvement in the subject’s state) that has been validated by research. There is a moving video report about this research from the University of New South Wales. We found this all rather heartening because we are aiming at the same effects with very similar methods in drama therapy. We have also observed similar ‘dose effects’ with engagement increase with each session of a programme and slow tail off of effect afterwards. As the recession continues some worrying divisions in our communities seem to be getting bigger. It isn't just the gap between rich and poor, clashes of religion or race, I have now heard several well educated and informed people talk about the way older people are “Taking away resources” from the young. I can only be amazed at supposedly intelligent people who want mandatory retirement at 65 to enable unemployed youth to have jobs – don't even think about skill levels and experience – whilst begrudging retirement pensions to the selfish elderly who won't work. I can't tell you how depressed and worried this makes me. If this is the standard of thinking that prevails then New Zealand is in dire straits indeed. We are all part of our country and we must remember that the true judge of any nation is how it provides for its most vulnerable – the very young, the ill and the elderly amongst others. All of the current infrastructure was paid for by by the taxes of the older generation as part of a long term view of building this country. Each generation makes its own contribution. If we descend into having the old compete with the young it is not only a specious, shallow and vicious piece of thinking, it also reflects a complete lack of any commitment to the future of this country and the in ability to think past the next moment. Each group has its own real and pressing needs. It is the job of the government – any government – to lead the goal setting and work out the resourcing, not to set groups against each other by implying that to fund one detracts fron the other. If ever we needed cohesion, it is now. So please do not by into this baseless, shameful view. It is only one step from talking about the “deserving poor” and even the Victorians rejected this eventually. Let's join the 21st century, together. Some of you may have heard a recent visitor from the UK – Graham Stokes, a Neurologist. He spoke to many groups about the huge increase world wide in dementia that is going to happen oveer the next 40 years. He cited many factors amongst them an increasingly long lived population, the “Baby Boomers” population bulge and better methods of diagnosis. It is not that rates of incodence of the condition are increasing, just that there will be a larger group from which people will develop the disease. He made it very clear that this is not a psychiatric condition but a neuorolgical condition, something that we are not always clear about even now. The points he made were very clear. There will not be enough beds to cope with the level of need. There will need to be better supports for families and carers in the community. It will not be possible to rely on “The Family” to automatically take on the very real burden of care because our society is changing so much. Women tend to marry men older than themselves and if a marriage is not providing what they want many are now divorcing in their 50's and 60's. Second relationships do not have the same level of establishment so if a partner becomes ill there is not the same commitment to taking on caring for them. We have another change in that children are economically dependent on their families for much longer. A combination of student debt, economic conditions in general and a much later date for settling down compared to previous generations. We are already seeing calls for the retirement age to be raised. A result from this will be that in some cases people who might have taken on care will still be at work. None of this paints a pretty picture but there are things that can be done. And we need to start now before the full force of this epidemic hits. Dramatherapy can help both the person diagnosed and their families and care givers. It is much easier to cope with the memory loss if the person is not depressed withdrawn or angry, if they communicate although not from the past. Using this therapuetic approach benefits the individuals,and their families and enables them to stay in their community for longer whether it be home or the retirement village they have chosen. We can do something that is positive in all directions, personally, socially and economically. But we need to act before we get overwhelmed. All those people who paid for the infrastructure we have now deserve better. Today's teenagers will not be thinking about this yet but when they do get old – and they are likely to live even longer, they might just be grateful for having good standards of care well established. One of the most important challenges any therapist faces is communicating effectively with their client.. We work hard to understand their context, their philosophy, their world view so that our interaction is effective. This is important when people are from similar settings, sharing the same cultural context. It pays not to make any assumptions as always. Oscar Wilde commented that England and The United States of America were two countries divided by a single language. What makes dramatherapy so effective is that it isn't tied to language or complex cultural norms. It's about being creative, working with the clients' imagination, working with them through the way they play. Play and fun a pretty much universal. Imagination is not a cultural specific although true respect for anyone mandates respect for their culture. We saw this today wonderfully illustarted by two Samoan ladies who do not speak a lot of English. We were greatly helped by having someone to go over what we were discussing with the group in Samoan but the actions that followed were a tonic for every one. The story created was about a trip to Samoa on a Sunday - so off to church for a blessing and then to the picnic. One lady stood and danced a beautiful slow hula and then the other sang. Everyone in the group loved it. In another story, a Maori lady who has severe cognitive impairment and only uses a few words of Te Reo dressed up, followed all the movements, and sat with a beaming smile. Of course culture is enormously important and we look forward to a time when we have enough drama therapists who are fluent in Te Reo, Samoan or whatever languages we need but until then it is so heartening to know that we can connect through creative thinking and action. I just got back from our first session with a new group, using drama therapy for people living with dementia. It was incredible. When you practice drama therapy, you have your own expectations and goals but you can never exactly predict what will happen. Today was beyond my expectations ... to see someone with very limited motor skills (this person had two carers stabilising her when she arrived), be able to get out of her chair and cross the room by herself, to be part of a story being acted out was inspiring. The power and persistence that was shown was simply amazing. Roll on next week to be blown away again! If there was ever a need at times to motivate us to do what we do, sessions like today’s was all the reason necessary. Communication is the key to working through personal issues and interacting with society. If we no longer can communicate, we become depressed and isolated. But often our feelings are misunderstood or unacknowledged. 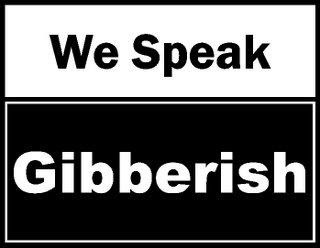 Are we simply speaking gibberish? Do we expect too much of others in requiring them to read between the lines? The difficulties with communication are compounded where a person has a disability (eg Autism, ID) or an illness (eg Dementia). In these instances, difficulties arise as a result of some type of barrier (intellectual or physical) between the person trying to communicate, and the person on the receiving end trying to understand the message being given. Drama therapy helps remove barriers and allows people to express (or communicate) their issues and feelings, and give them form - often indirectly. A drama therapist is trained to read between those lines and help the client interpret what they express in therapy. A person might create a story about an angry boss, firing an employee. This could represent a feeling of needing control, or being allowed to vent frustration and anger. For those that are non-verbal, drama therapy provides the opportunity to use mime and gesture to convey their needs. The therapist’s response validates those actions and empowers the person. A growling lion will scare the duck (representing in a different way the same feelings as the angry boss firing an employee in the example above). Purring noises being an indication of needing to be accepted and loved. Through positive reinforcement (e.g. responding to the person’s particular way of communicating (and teaching others how to similarly respond)), a person will start to become more interested in trying to communicate. For example, those with Dementia come out of their state of isolation, and start to get interested once again in the world around them - starting with forming sounds, they move on to seeking to initiate contact, and often begin to use words again. By making an effort to understand apparent gibberish (in some cases, be it growling, shushing, or tapping) and seeking to remove barriers to communication, we might open up a whole new and rewarding world for all involved. Call at our main website for more material or contact us to discuss how we can help you or your organisation through out techniques. This work is licensed under a Creative Commons Attribution-NonCommercial 3.0 New Zealand License. Ethereal theme. Theme images by mammuth. Powered by Blogger.